Is internal rate of return or net present value better? Financial managers and business owners usually like performance measures expressed in percentages instead of dollars. As a result, they tend to prefer capital budgeting decisions expressed as a percentage, as with the internal rate of return (IRR), instead of in a dollar amount, as with net present value (NPV). But even though the internal rate of return is usually a reliable method of determining whether a capital investment project is a good investment for a business, under some conditions IRR is not as reliable, but the NPV is. Internal rate of return is a way of expressing the value of a project in a percentage instead of in a dollar amount. In the language of finance, the internal rate of return is the discount rate or the firm's cost of capital, that makes the present value of the project's cash inflows equal the initial investment. This is like a break-even analysis, bringing the net present value of the project to equal $0. Put differently, the internal rate of return is an estimate of the project's rate of return. The internal rate of return is a more difficult metric to calculate than net present value. With an Excel spreadsheet, iterating the information and finding the rate of return that sets the project value to $0 is a simple function. Before electronic spreadsheets, financial managers had to calculate it using trial and error, which was a long and complex process. The IRR method is usually correct, but some exceptions can make it wrong. If the IRR of a project is greater than or equal to the project's cost of capital, accept the project. However, if the IRR is less than the project's cost of capital, reject the project. The rationale is that you never want to take on a project for your company that returns less money than you can pay to borrow money, that is, the company's cost of capital. Just as with net present value, you have to consider whether you are looking at an independent or mutually exclusive project. For independent projects, if the IRR is greater than the cost of capital, then you accept as many projects as your budget allows. For mutually exclusive projects, if the IRR is greater than the cost of capital, you accept the project. If it is less than the cost of capital, then you reject the project. 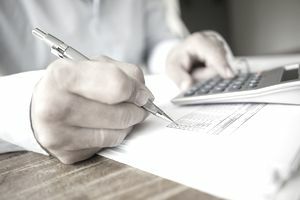 The more commonly used NPV is found using a discounted cash flow model, and the net present value calculation discounts each cash flow separately, which makes it a more refined analysis than an IRR calculation. If rates of return vary over the life of the project, an NPV analysis can accommodate these changes. The NPV model also works better when the discount rate isn't known, and as long as a project's NPV is greater than zero, the project is considered financially viable. Net present value means that a project's future cash flows are discounted to their present value using a discount rate, and the initial investment is deducted to find the value of the net cash inflows. You essentially calculate the difference between the cost of a project, or its cash outflows, and the income generated by that project, or the cash inflows. A company's discount rate is often determined by performing a weighted-average cost of capital (WACC) analysis, which approximates the company's historical average cost of funds from both equity and debt. This calculated rate considers the risk-free rate, market rates, market volatility (beta), and the firm's typical debt and equity weights. At times, the decision criteria of internal rate of return and net present value give different answers in a capital budgeting analysis, which is one of the problems with internal rate of return in capital budgeting. If a firm is analyzing mutually exclusive projects, IRR and NPV may give conflicting decisions. This can happen if any of the cash flows from a project are negative, aside from the initial investment. Everything points to the net present value decision method being superior to the internal rate of return decision method. One issue that business owners also have to consider is the reinvestment rate assumption. IRR is sometimes wrong because it assumes that cash flows from the project are reinvested at the project's IRR. However, net present value assumes cash flows from the project are reinvested at the firm's cost of capital, which is correct.